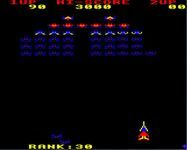 Arcadians is a shoot 'em up very similar to the Namco Ltd. arcade game Galaxian. The player controls a ship at the bottom of the screen, able to shoot upwards but only so that one shot is on screen at any given time. Above him a pack of aliens move from left to right, then back. From time to time an alien or group of aliens will swoop and attempt to dive bomb the player. Once all aliens have been shot the player advances a stage and faces a more difficult variation on the same challenge. Source: Wikipedia, "Arcadians (video game)," available under the CC-BY-SA License.